When you know what I do about state and local government revenues and expenditures (and I’ve worked very hard to make that possible), much of what you hear about state and local government in the media is really aggravating. Because you know what is being reported is misleading at best, and deceptive at worst. Recently, it was reported that NYC police sergeants had stated taking pictures of homeless people and posting them online to “document the decline of the city” under the DeBlasio Administration. Probably in political retaliation for Mayor DeBlasio not agreeing to restore the previous level of disability fraud in NYC’s uniformed services. The Mayor responded with the assertion that the problem is the people of the city are not paying enough in taxes for social services. He didn’t say that directly, of course, but unless he somehow thinks money can drop from the sky (or the State of New York can give him more money to give to other people without charging city residents more in taxes), that is the reality of what he must have meant. The reality is that city funds “for the poor” have not been cut, just shifted. And more isn’t being added for the poor (or other things) not because the tax burden is going down, but because in the past future money was taken off the top for other things with the bill shifted to the future, which is now the present. See the chart below. 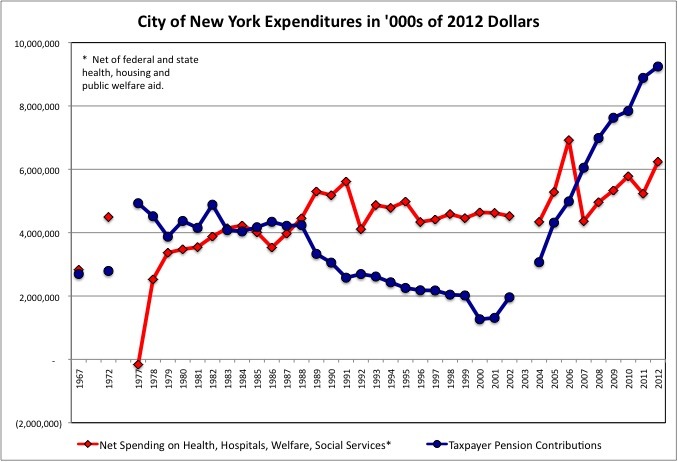 Because of the way Census Bureau state and local finance data is compiled, I can’t separate the City of New York’s intergovernmental federal and state revenues for public hospitals, public welfare, social services and health from each other to calculate the net cost of these functions to the city. So what you see is the net City cost of everything in those categories, added together. In an effort to say the rising cost of pensions is not so burdensome, there are those who give its cost as a percentage of the entire city budget. But with much of the cost of social services within its borders carried on the City of New York’s books, even if most of the money comes from Washington and Albany, this is not a fair comparison. The city can’t just shift state and federal Medicaid funds to pensions as pension costs rise. This money is merely passing through the city under rules set elsewhere, and if the city doesn’t follow the rules and use them for this purpose, it doesn’t get the money. While taxpayer underfunding is the greater cause of pension crises elsewhere, retroactive pension increases scored by public employee unions in exchange for political support are the primary cause of the crisis in NYC. They are doing all they can to find someone else to blame, and in most cases Mayor DeBlasio is playing along (whether he will continue to do so when the stock market turns down and he has to start allocating the losses remains to be seen). That’s why it is particularly offensive to me for the unions to point fingers at the poor. Given how high NYC’s state and local tax burden is, on the other hand, and how it has gone up, it is also offensive for politicians to imply people are homeless and suffering because city residents have been unwilling to pay enough in state and local taxes. That accusation should be made, if at all, about the places many of NYC’s homeless are coming from, places with a far lower tax burden than ours. For anyone interested in more detail on how NYC’s spending on the poor has varied over the years, and now it compares with other places, that information is (once again) here. And Census Bureau data on public and private employment in these categories is here. I’ve been following these issues for a long time. And it that time, the only people anyone has dared to tell that they were taking too much out, not putting enough it, and had to be more fair to the rest of us is the poor. That wasn’t wrong, and it wasn’t to their detriment. But to continue blaming them for our problems 20 years after the whole “welfare reform” era, the facts be damned, is the height of chutzpah. What the political/union class really needs is for NYC’s welfare rolls to soar. So they can be tagged with a huge share of the blame in exchange for very little money, to distract attention from big money going elsewhere. And politicians can hurrumph with their usual left wing and right wing talking points, while their backers laugh all the way to the bank.